Analytical microarrays feature great capabilities for simultaneous detection and quantification of multiple analytes in a single measurement. In this work, we present a rapid and simple method for bulk preparation of microarrays on polycarbonate sheets. Succinylated Jeffamine® ED-2003 was screen printed on polycarbonate sheets to create a polyfunctional shielding layer by baking at 100 °C. After microdispension of capture probes (antibodies, oligonucleotides, or small molecules) in a microarray format, chips were assembled with a flow cell from double-sided tape. It was shown that the shielding layer was firmly coated and suppressed unspecific binding of proteins. Universal applicability was demonstrated by transferring established flow-based chemiluminescence microarray measurement principles from glass slides to polycarbonate chips without loss of analytical performance. 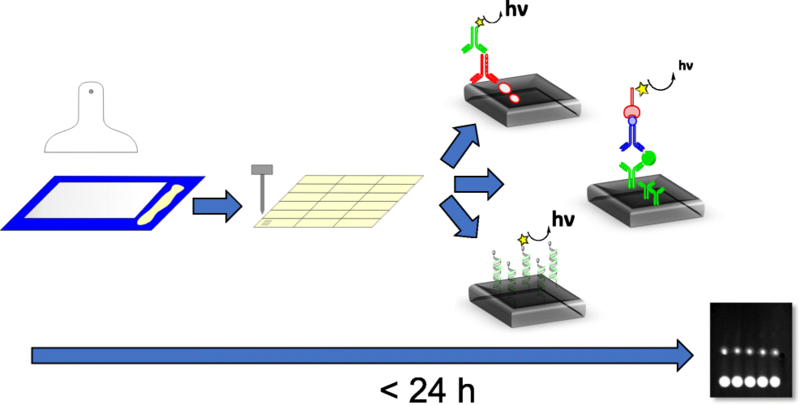 Higher chemiluminescence signals could be generated by performing heterogeneous asymmetric recombinase polymerase amplification on polycarbonate chips. Similar results could be shown for sandwich microarray immunoassays. Beyond that, lower inter- and intra-assay variances could be measured for the analysis of Legionella pneumophila Serogroup 1, strain Bellingham-1. 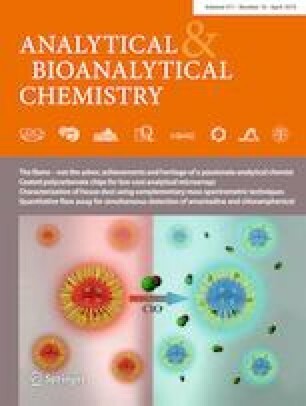 Even surface regeneration of indirect competitive immunoassays was possible, achieving a limit of detection of 0.35 ng L−1 for enrofloxacin with polycarbonate microarray chips. Succinylated Jeffamine ED-2003 coated polycarbonate chips have great potential to replace microtiter plates by flow-based chemiluminescence microarrays for rapid analysis. Therefore, it helps analytical microarrays to advance into routine analysis and diagnostics. The authors thank Dr. Christian Lück (Konsiliarlaboratorium für Legionellen, Dresden University of Technology) for providing the monoclonal antibody 10/6 specific for Legionella pneumophila serogroup 1 strain Bellingham-1 and Prof. Erwin Märtlbauer and Dr. Richard Dietrich (Chair for Hygiene and Technology of Milk, Ludwig-Maximilians-Universität München) for providing the monoclonal antibody mAb 1F7 reactive against clinafloxicin and enrofloxacin. The authors also thank Dr. Thomas Baumann (Institute of Hydrochemistry and Chair of Analytical Chemistry and Water Chemistry, Technical University of Munich) for the advice on image processing and analysis. This work was funded by Bundesministerium für Bildung und Forschung (BMBF) – LegioTyper (FKZ: 13N13698) and received partial support from Hanns Seidel Foundation.